The Hoffmann & Schuback foundry was located at the west end of Horatio St. near the Hudson River from approximately 1884 to 1897. The company was also known as the Eagle Wrought Iron Works. The partners were Joseph Hoffmann and John Schuback. This partnership seems to have ended in the early 1890s, and Schuback carried on alone. In 1898 he moved the foundry uptown to 103-107 W. 108th St. In the mid-1900s Schuback seems to have sold out to Gustav A. Schlaier (1863-1919). Then in 1909 Schlaier moved the business to 580 Robbins Ave. in the Bronx. Later the address became 577 Jackson Ave., Bronx. (On early Bronx maps Jackson Ave. appears as a northern extension of Robbins Ave., which ran from Southern Boulevard at 138th St. north to Westchester Ave. between Powers and Concord Avenues. The whole stretch is now (2010) called Jackson Ave.) Gustav Schlaier and his sons, Gustav Joseph Schlaier (1888-1962) and Frank Joseph Schlaier (1891-1976), continued the business, Gus Schlaier's Sons Iron Works, into the 1960s[?]. The business name, Eagle Wrought Iron Works, does not appear to have been used after 1917/18. In 1885 Hoffmann & Schuback were described as follows in New York's Great Industries, 1885, "Eagle Wrought Iron Works, Hoffman & Schuback, Proprietors, Nos. 123 and 125 Horatio Street. - For many years the iron manufacture has constituted one of the most important of American industries. It is a line of commerce necessitating the employment of a vast amount of capital, and one which in its various phases from mining to manufacturing, affords a source of income for a great multitude of people. Among the prosperous houses at present engaged in this line in this city may be mentioned that of the Eagle Wrought Iron Works, which though of comparatively recent establishment, is rapidly assuming a position among the leading houses in the trade. The business was established in June 1884, by Messrs. Joseph Hoffman and John Schuback. The location, at No. 123 and 125 Horatio and No. 527 West streets is a most desirable one, being situated near the center of a large and prosperous district, while its proximity to the river affords superior facilities for shipping and the receipt of goods. A series of appropriate buildings are occupied, having an area of 50x85 feet on Horatio and 30x50 on West streets. The line of production includes iron railings, stoop doors, window guards, &c., and the excellent workmanship exhibited, and the high quality of the goods produced have already secured a high reputation, and large and lucrative patronage. The members of the firm are both practical men of extensive and valuable experience. Mr. Hoffman, the senior member, is a native of Germany, in which country he early acquired through a long term of apprenticeship, a thorough knowledge of the trade. He came to this country in 1869, and was employed in responsible positions until the spring of 1884, when he joined with his partner in establishing as above. Mr. Schuback is also a native of Germany, and like his partner, learned his trade in the old country. He came to this country nineteen years since, and in the interval between his arrival and beginning business for himself, was a valued employee of one of the oldest iron houses in this country..."
John Schuback, although he "learned his trade in the old country," appears in New York city directories from 1870 to 1885 as a grocer. He is also recorded in the 1880 U. S. Census as a retail grocer. In the census he was 33 years old, born in Hannover, Germany, and he lived at 280 W. 12th St., Manhattan. In the late 1870s Schuback was in partnership with Henry J. Ohlckers (1850-1905), also an immigrant from Hannover, Germany. I have not been able to identify Joseph Hoffmann prior to 1886 when he appeared in Trow's New York City Directory as "Hoffmann Joseph, railings, 123 Horatio, h 792 Washn." His last listing in Trow was in 1891. Gustav Schlaier was recorded in the U. S. Census of 1900, living in Guttenberg, New Jersey. He was born in Germany, Dec. 1863, and he immigrated in 1884. His sons, Gustav and Frank, were 12 and 9 years old respectively. He also had three daughters, Elsie 15, Katie 13 and Annie 7. Schlaier's wife, Katherina Schlaier (née Stumpf), died in 1938, when her estate was appraised at gross assets of $95,027 (New York Times, 1 Sep 1938, p. 44). Both of Schlaier's sons, Gustav Joseph Schlaier and Frank Joseph Schlaier, registered for the World War II draft in 1942 when employed at Gus Schlaier & Sons, 577 Jackson Ave., Bronx, NY. Frank Schlaier was 51 years old and lived in North Bergen, New Jersey, and Gustav Schlaier was 54 years old and lived in West New York, New Jersey. 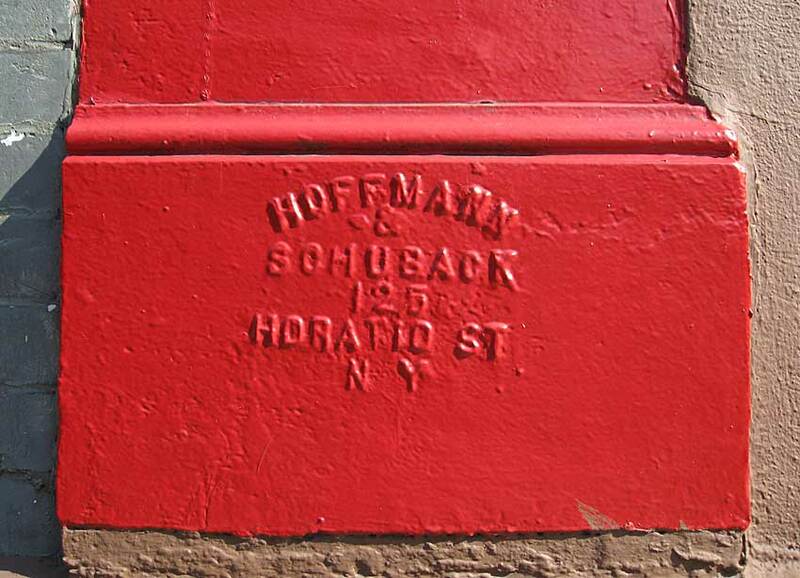 A heavily painted foundry mark for Hoffmann & Schuback is found at 324 E. 73rd St.
A coal chute cover marked "H.-S., 123 Horatio St" is found at H.-S. [Hoffmann & Schuback] in the manholes section. A coal chute cover marked "John Schuback, 123-133 Horatio St" is found at John Schuback in the manholes section.